Best Angle Grinder 2019 - Do NOT Buy Before Reading This! Angle grinder, also known as side grinder or disc grinder is a very popular hand power tool. It is used to grind, sand, cut and polish a wide range of materials. This is done by attaching different attachments or wheels, depending upon the job that needs to be done. Finding the best angle grinder for your particular need is important because of this a tool that will serve you in multiple ways, making your work a whole lot easier. As we can understand from the definition, an angular grinder has to be very strong. The grinder gets pushed against hard materials while doing the job and that means the structure needs to be able to take a lot of punishment. Every holding bolt should be tight and of the best quality, because the last thing you want is things flying around your garage while you’re using your grinder. An angle grinder can be powered by a petrol engine, an electric motor, even compressed air. What makes an angle grinder a versatile tool are the attachments you can use with it. These attachments come in a wide range of sizes, thickness, and texture each designed for a specific task. Some of the most used attachments are grinding stone disc, sanding disc, flap disc, carbon steel wire wheel, stainless steel wire wheel. Although the market is full of different hand tools, only a few contain the necessary features. Your hand tools are not something you can take a chance with. That’s why, assessing the features and compare them beforehand to find out the suitable one for you is important. Let’s check our top 10 best angle grinders. If you need a cheap angle grinder that can handle a wide array of works, then PORTER-CABLE PC60TAG is for you. The Porter Cable grinder runs at 11,000 RPM which is quite fast for removing materials. The motor power is 6 amp, which means the grinder has got a decent motor for various jobs. The grinder comes with a side handle for easy maneuver. The grinder comes with a powerful 6 amp motor, which means it can do different jobs like cutting metal, tuck-pointing, and cleaning and finishing surfaces with ease. The PC60TAG has an RPM of 11000 which delivers top notch material removal performance. The size of the disks is 4 ½ inches. The easy bit switching design delivers quick switching of bits and disks with a simple one wrench lock mechanism. The dimension of this product is 13 x 4 3/4 x 5 5/16 inches, and the weight is only 4.1 pounds. The grinder comes with a 3 position side handle that can be used in right, left and upwards position. The PORTER-CABLE PC60TAG comes in a sturdy cast metal gear case which protects it in the case of drops and bumps, increasing the tool life. Delivers good power and rotation for smooth metal cutting, grinding and polishing jobs. One of the best grinder in cheap price. Ergonomic design, the lightweight ensures the user can use it for a long time. Comes with a detachable side handle. Comes with a rapid release guard which makes it simple and quick to remove or adjust the guard. The spindle lock system allows the user to have single wrench bit changes, which saves time at the job site. If you’re looking for heavy duty grinder for construction works, this might not be appropriate. People who used it for home and construction works said it is the best for welding. The Makita 9557PBX1 features a powerful 7.5 amp motor that can create 10000 RPM. The machine comes with an additional safety like a dead man switch to prevent the machine from accidental powering. The machine also comes with a spindle lock for easy wheel changes. The powerful grinder has an exclusive labyrinth construction to prevent the motor and bearing from contamination. The Makita grinder features an ergonomic design. The grinder has a small diameter barrel grip of 2.5” for added comfort. The Thicker coil wires are wound more closely to avoid energy loss and rapid heating. The Makita 9557PBX1 has a powerful motor of 7.5 amp. The motor delivers a speed of 10000 RPM. The grinder comes with multiple dust protection. The dimension of this grinder is 15 x 5.75 x 10, the weight is only 4.5 pounds, suitable for long use. The machine has a lock on/off feature for continuous operation. The machine comes with a side handle for better control. The safety measures the Makita comes with is amazing. The maze construction seals and protects the motor from extra hitting. The machine comes with AC/DC switch which means you can use it with an alternative power source. There is a safety switch to avoid unwanted powering of the machine. The Makita 9557PBX1 is lightweight and comes with a slick handle, but do not get fooled by that. The powerful motor and RPM delivers the user with a wide range of heavy tasks. Comes with additional accessories like a wrench, side handle, flange, grinding wheel and a wheel guard. Extra-large paddle switch and adjustable guard for added security. The machine can be run by alternative power sources. Might seem a little costly for those who have a lower budget. Dewalt is an established company and renowned for manufacturing quality hand tools. The DEWALT DWE402 is no different. The angle grinder comes with a whopping 11 amp motor which is pretty much enough for all kinds of jobs. If you’re looking for powerful, yet compact grinder, this product with the weight ratio of 1.8HP will serve you very well. The grinder comes with additional features like dust ejection system that keeps the machine protected from dust and increases lifespan. The DEWALT DWE402 comes with 11 amp motor and 11000 RPM, a truly powerful machine. The machine can run on both AC/DC current and comes with the most impressive weight-power ratio on the market. The model comes with oversized brushes that provide double brush life, and the large spiral bevel gear provides long transmission life. The grinder also provides a 360 degrees adjustable guard with a single action. The wheel can be removed easily without needing any wrench using the quick-change wheel release mechanism. The machine has a protected spindle lock button that can maximize the depth of cut. The dimension of this grinder is 15.6 x 5.9 x 4.8 inches. Weighing 6.2 pounds, the DEWALT DWE402 does not carry the vibration to your hand. The small gripping surface ensures better comfort for the user. The machine comes with a 2 position side handle. The auto off brush features automatically shut down the machine when the brushes wear off. One of the most powerful machine in a very cheap price, suitable for grinding, cutting and polishing metals. Dual ejection system keeps the motor from contamination. The adjustable easy removable wheel can rotate 360 degrees. The wheel can be changed quickly without needing any wrench. The grinder comes with additional features with paddle switch, safety lock, and auto off brush features. Can be used with AC/DC current. The disk size is suitable for precision works. A Little bit heavy for continuous use. Weighing only 4 pounds, the Hitachi G12SR4 is one of the most lightweight angle grinders on the market. This is a suitable home improvement tool as it can carry out tile cutting, sharpening blades, rust removal jobs easily. The lightweight also ensures it can be used for overhead operations safely. 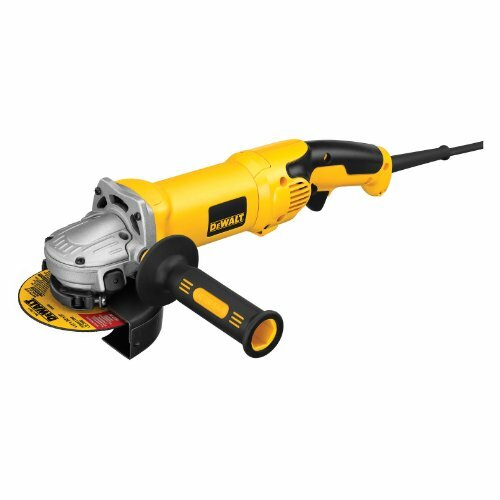 The grinder is a medium duty grinder featuring a decent 6.2 amp motor with an output of max 980 watts. The grip perimeter is only 7-8 inches meaning this is a suitable tool for long tasks. This is a 4 ½” and 6 amp grinder that can be used for household works and light professional works like casting fin, finishing various metals, grinding welded sections etc. The machine comes with additional accessories like a carrying case and 5 grinding wheels. The grinder features a low diameter grip for reduced fatigue and a comfortable hold. The Hitachi G12SR4 has a trigger lock mechanism for continuous operation, also it has a quick-off feature with a left-mounted slide switch which ensures safety. The grinder comes with a removable and forward-canted side handle that allows the user to perform detailed and precise works. The dimension of the Hitachi G12SR4 is 10 x 4 x 4 inches, and the weight is only 4 pounds. Which means the grinder can be maneuvered easily for overhead tasks. The grinder comes with a plastic case and spanner to replace the wheels easily. One of the most lightweight grinders on the market, the grinder offers enough powers for household grinding, edge sharpening and paint removal jobs. The grinder comes with a low profile gear case to help get into the tightest areas. Can be used in tight angles for a work that demands precision. The small diameter grip ensures that the user can hold it for a long time, the side handle allows the user to use both hands for better control. The G12SR4 comes with a protective case and 5 abrasive depressed center wheels, the guard can be removed easily while replacing the wheel. The on-off switch is a little difficult to press with the gloves on. When you see a product from Dewalt, you should be assured that they are of good quality. Because Dewalt is here in this business for a long time and one thing they have consistently is customer satisfaction. 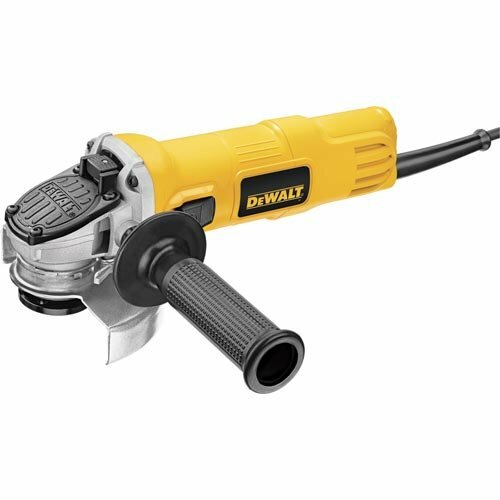 The DEWALT DWE4011 is a fine example of powerful motor combined with high RPM to make material removal process super-fast.This one we call best small angle grinder in our top 10 angle grinder list. The versatile grinder comes with a one touch guard feature, which enables the user to simply move the guard to adjust the position. The grinder features an ergonomic body which enables the user to work in tough angles and for a long time. The grinder has a powerful motor of 7 amp, dual AC/DC current and a massive 12000 RPM suitable for any material removal job. The grinder is ideal for concrete repairing workers, mechanical servicers, and fabricators. The slick design ensures that the grinder can be used in works at tight spaces like grinding welds, beveling and grinding steels, cutting steel plate and pipe, and concrete surface. This 4 ½” grinder comes with a one touch adjustable guard, the guard can be removed easily while replacing the wheel. The guard also can be adjusted depending on which angle you’re working. The grinder comes with an easy to grip two position side handle. The dimension of this grinder is 15.4 x 4.6 x 6.1 inches. The weight is very lightweight at 3.9 pounds. The grinder provides a maximum horsepower of 1.14 HP. The machine comes with a hex wrench instead of a spanner which is actually good. Because hex wrenches can be found easily in most tool boxes when lost. It has a jam-pot and low profile gearbox which allows the tool to fit in tight space, thus increasing durability. 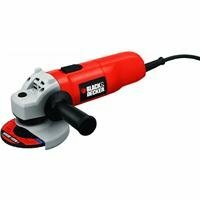 One of the most RPM providing grinder at a low price. Suitable for household and construction works. The weight and ergonomic design ensure the worker can word with it for long hours without fatigue. Comes with a side handle, the easily adjustable guard can be moved with one touch. The DEWALT DWE4011 comes in a gear case for increased durability. The On/Off switch is too adjacent to the grinding wheel. The Milwaukee 2680-20 is a popular tool and known as the best cordless angle grinder generally used by the professionals due to its sturdy and reliable construction. The powerful grinder comes with a four pole motor along with overload protection so that it can take a huge amount of punishment. The Milwaukee 2680-20 is a cordless grinder, still, it comes with a paddle switch. The company claims this grinder to be the only cordless one with a paddle on/off switch and so far we think that’s true. The grinder comes with a four pole motor which delivers the user with maximum velocity and power. The machine also comes with an overload protection to prevent damages of the battery or the tool in abusive conditions. Its L-shape vent keeps fragments from entering the tool and damage the motor and internal components. The Milwaukee grinder comes with a tool-free, eruption resistant guard for easy and quick guard movement. The grinder comes with a paddle switch and this is the only cordless grinder on the market with paddle switch. That’s great because in the case it falls from the hand or takes any hit the motor shuts off automatically. The grinder has a 3 position side handle for more control and comfort. The powerful grinder runs at 9000 RPM and weighs 5.3 pounds. The grinder is widely used by professionals and construction workers because it can take a lot of punishment. Comes with a powerful motor and delivers ample RPM for your cutting, metal removal or grinding job. This is the best cordless angle grinder which gives you the portability you want. It has a vent that keeps dirt and scraps from entering the machine which makes the machine very durable. The paddle switch offers more security and the side handle can be set in 3 positions according to the user’s preference. This is a tool only purchase, you can get a case, battery, and charger with some additional payments. 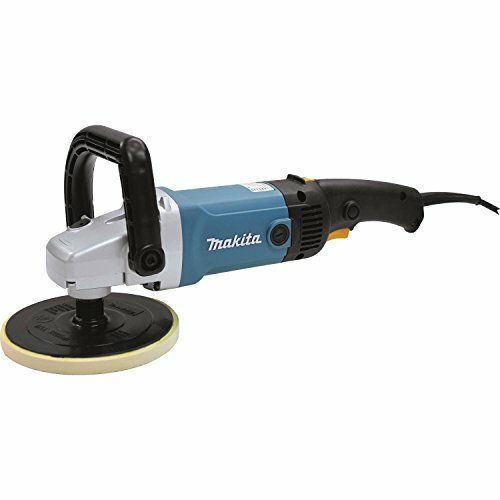 As the name suggests, the Makita 9227C is a master of slow polishing and clear coating finishes. This powerful grinder comes with a variable speed of 0-3000 RPM which makes it suitable for polishing and cleaning. This 7-inch diameter can feel in larger wheels to cover a lot of areas and the powerful 10 motor provides strong power. 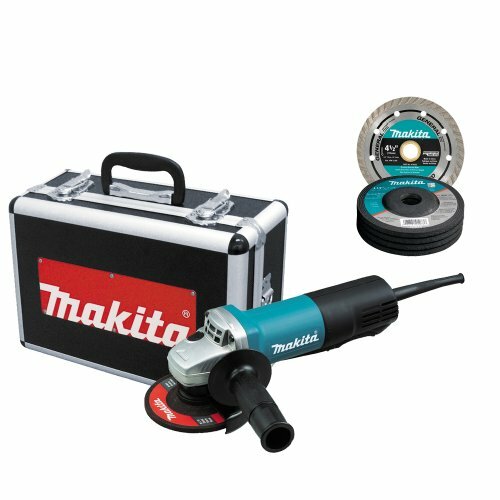 The versatile Makita 9227C can easily convert into a sander. From polishing your car to finishing your welding job, you can use it for a wide range of works. This is the best 7 inch angle grinder you can get for the price. 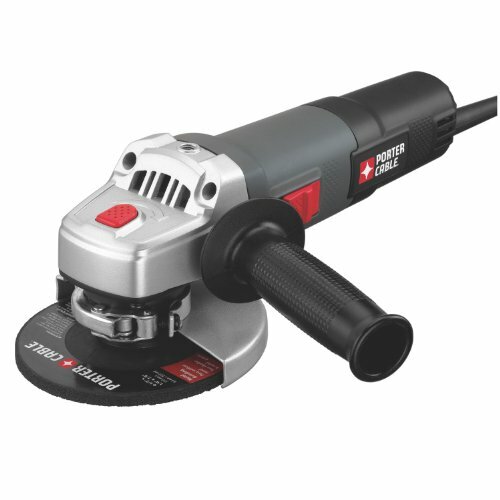 The 7-inch grinder is a popular choice among marine and automotive enthusiasts for sanding and polishing job. The grinder comes with a 10 Amp motor which delivers a variable speed ranging 600-3000 RPM. The electric speed control contains the speed continuously under load. The grinder comes with a soft start feature that enables a smooth start, and the lock on button offers continuous operation. The machine comes with an ergonomic side handle for better performance. If you’re looking for a more comfortable grip, the loop handle will provide you with that. There is a three-prong plug which comes to avoid static electricity accretion. The dimension of this product is 20 x 7 x 7 inches, and the weight is 6.6 pounds. This machine can easily convert into polisher/ sander and provides quick yet powerful polishing. The grinder comes with additional wool bonnet, hook and loop pad to start your work with. The speed can be pre-set and this provides the user with the opportunity of slow polishing works. The design is quite ergonomic. I mean you won’t find two additional handles in the form of side handle and rubberized grip handle with any other grinder. The best 7 inch angle grinder. The variable speed and maximum speed control allow the user for a slow, controlled sanding or polishing job. The machine comes with a Wire-mesh cover to prevent the wool fibers from inflowing the motor. The soft start enables the machine to start slowly and smoothly, ensuring your painting, polishing or waxing won’t get ruined. The price might seem a little higher, but the features the machine offers, it’s actually cost effective. The Kawasaki 841428 is a heavy duty grinder perfect for those who are serious about getting the job done fast and clean. This grinder comes with a decent 7.5 amp motor and delivers 11000 RPM for heavy works. The grinder is very sturdy and comes with a wheel diameter of 4 ½” which offers that a wide range of works can be done with it. Leading the market for over 35 years, the Kawasaki brand is known for their quality materials that can withstand even toughest abuses. The Kawasaki 841428 is also suitable for different jobs like grinding metals, removing paints and rust, sharpening cutting edges and cutting tiles. This cheap angle grinder can any kind of job as it has a powerful motor to finish the task. The grinder is officially licensed by Kawasaki, which means they ensure this product gets to the hand of the customers with the highest quality. The grinder is also tested for durability. The grinder comes with an input power of 7.5 amp, which is a medium range motor suitable for a wide range of works. The machine delivers a speed of 11000 RPM and loved by those who want their work fast and efficiently. The dimension of this grinder is 2.5 x 9.5 x 15.6 inches and it comes with a weight of 5.7 pounds. This electric powered grinder also features a comfortable 3 position side handle for getting precision works done with ease. The lock on button ensures safety and continuous work without any hindrance. The Kawasaki 841428 also comes with an adjustable guard which will not only protect you from byproducts emanating during the work, it’s also adjustable. The Kawasaki grinder is very cheap. But do not think its low quality, because the users appreciated this product with a lot of praise and positive ratings. 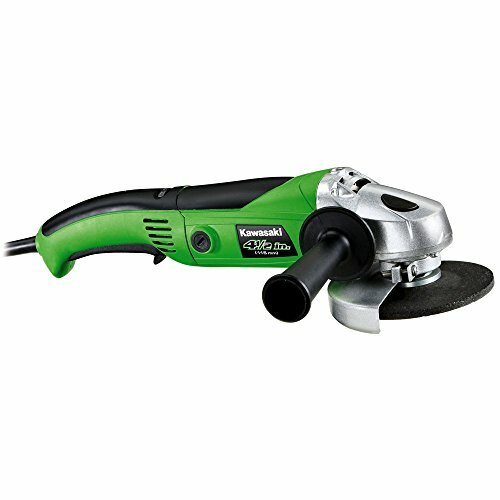 Different jobs like cutting tiles, grinding steels, removing paints, resharpening edges can be done with this grinder. The Kawasaki 841428 comes with a lock on/off button and side handle which provides security as well as comfort to the user. Some users found it hard to engage the trigger. The Black and Decker 7750 is a basic angle grinder which is very suitable for home use. The grinder is lightweight and very easy to use. The wheel switching is very easy and takes no time. The grinder can be used for a wide array of works like grinding, cutting, metal and paint removing. If the price is a concern of yours, then the Black & Decker gives you an opportunity to buy a grinder sufficient for your home uses without breaking the bank. The entry level motor of 5.5 amp can deliver some raw power with a speed of 10000 RPM. If you don’t have any heavy duty professional approach in mind, then this grinder is a perfect choice. Bullet Point 1The grinder comes with a decent 5.5 amp motor, which is enough for your household works like polishing, sanding and grinding. The motor delivers a good 10000 RPM speed. The dimension of this grinder is 12.63 x 5.5 x 5 inches. The spindle size is 5/8 to 11 inches. The grinder features a 2 position side handle for a comfortable grip. Also, it has contoured body grip which provides the user ease and comfort. It is a 4 ½” grinder, which offers a great variety of wheels compatible with it. A spanner and a metal grinding wheel come along with the product. There is a spindle lock function to help you with switching the wheels easily. The grinder can withstand even rough uses without being heated. The grinder comes with a gear case made of metal for increased durability. Highly operative motor and great RPM provides the user with enough speed for normal works like grinding, sanding or paint removal. The grinder is very lightweight, not only in weight but also in price. The weight helps the user to use it for a long time without any fatigue. The spindle lock function makes it easy to keep the wheels in position. The side handles and soft grip on the handle provide the user with comfort. It’s amazing for lightweight and home improvement works, but not so suitable for heavy construction works. Dewalt is the market leader for hand power tools for a reason. They set the benchmark while others try to catch them. The DEWALT D28115is a great example of a quality tool along with security and comfort. The 402K is one of the best steel grinders, the motor provides an ample 13 amp power for that. The grinder comes with a dust fire feature which prevents the dust and other small particles to enter and contaminate the motor. The metallic body and side handle grip provide a structure that is sturdy and comfortable. 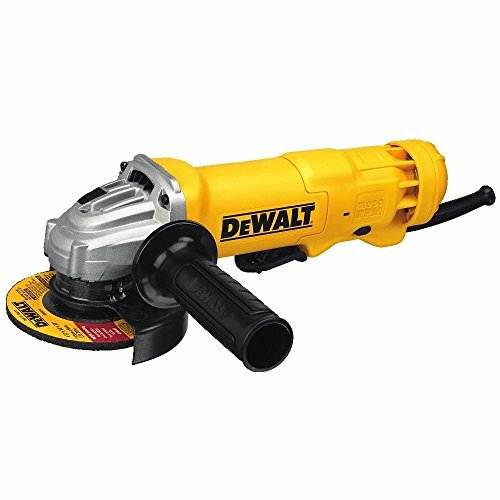 This 4 1/2 “grinder comes with a very powerful motor of 13 amp and 9000 RPM. This amazing 2.3 horsepower motor provides you ample power for any household or professional work. The quicker material removal comes with an overload prevention feature. The grinder has an ergonomic design. The grip barrel provides you with coziness for long uses. The grinder comes with a side handle which is helpful when doing precision works. The grinder also has an automatic dust expulsion system to remove the dust before it enters the machine. There is a quick-change wheel release which permits easy wheel removal without using any tools. The auto on/off features enables the grinder to shut off automatically in case of heat increase or wearing off the brush. This protects the grinder from damages. The dimension of this grinder is 18 x 6 x 5 inches and it weighs only 4.2 pounds. The DEWALT D28115 comes with a tool-free guard adjustment which increases your mobility as well as the security. The handles are properly gripped so that the vibration doesn’t travel back to the hands. The auto on/off features ensures proper security of the user. The grinder comes with a quick-change wheel replacement option which saves time at the job site. The power and the RPM provide the user a lot of power for various heavy duty works. This grinder can be used for personal and professional purposed simultaneously. The 2.3 horsepower makes it sure it can perform any work you throw it. The auto dust removal system and abrasive protection ensure the motor and the tools stay contamination free. Not anything we can think of. 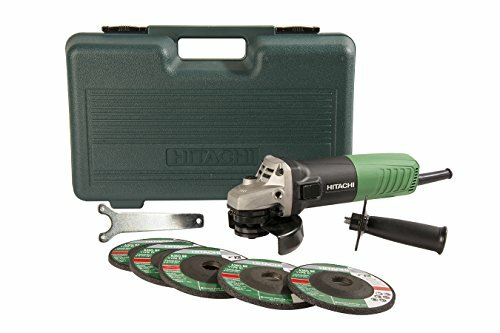 What to look for when buying an angle grinder, how would anyone know if the grinder can fulfill his needs, is the price appropriate for the given features? As DIY enthusiasts, we know how it feels when your hand tool doesn’t serve you properly. It will lead to bad quality of work and probably more time in fixing the errors. That’s why compiling a buying guide of each and every feature you should look for while buying an angle grinder wasn’t just a pastime. In fact, it’s important for us to share the knowledge so that our fellow hand tool guys can save themselves a lot of extra works, and an extra afternoon to spend with the family. An angular grinder can be used for metal cleaning. If you have a more than 5 years old car, which passes season after season of snow, rain, and heat, then nothing can you do about the car unless you have an angular grinder at hand. A wide range of corroded metal can be stripped, cleaned, deburred using angle grinders. There are different types of wheels suitable for different tasks. In fact, it’s the main thing you should keep in mind. Without having the right wheel and the right machine to support that, your purchase is pretty much useless. Although almost all of the grinders are made for all types of wheels, make sure you know which one is used for which purpose. Diamond– Cutting stones, concretes, tiles or other hard metals. Brush– Cleaning and deburring metals, removing rust. Aluminum– Cutting bolt, rod, bars, or wood and polishing. Great for woodworking. Flapper- Used for sharpening, sanding, restoring edges of knives or other sharp edged tools. Silicon– removing mortar and sharpening, rounding and cleaning tasks. Fiber– Used to remove rust and burrs from metal. The size of your disk depends on what type of work you’re going to do. Large disks make it easy to do large and heavy jobs. On the other hand, a small disk is suitable for precise and detailed work. Small disks allow you to explore tiny corners without damaging the machine. Small grinders are available in 4.5 inches and 5 inches size, usually enough for home projects. Professionals and construction workers may need a bigger size of 7 inches or more. Each angle grinder comes in different wattage, voltage and amp ratings. Grinders with a stronger motor are capable of working with harder materials. While grinders with weaker and smaller motors are built for working with softer materials. Angle grinders come in different watt ratings, ranging from 500-2500 watts. The Voltage ratings are generally between 110-230 volts. The most important numeric value to determine how powerful your grinder is the amp rating. Amp ratings usually travel within 4 to 15. While the lower rating is sufficient for household works, professional workers need higher amp rating in the grinder. Your grinder should have an ergonomic design that provides you with comfort. The comfort generally depends upon two things, the size, and the weight. If you intend to use the grinder for a long time simultaneously, you might want a smaller unit. Also, the grip should be comfortable enough to hold it for a long time. The grip should be anti- vibrant so that the vibration doesn’t travel back to your hand. More powerful motor means more weight. Although power is needed, a hefty weight will make it tough for the worker to hold it continuously. Make sure you make a balance between these two. Some grinders come with side handles. Although that’s not a must have feature, side handle is really helpful for better control and precision. Some grinders have detachable side handles that can be attached to the right or left, depending upon whether it’s used by a right-handed or a left-handed person. Safety is important while using tools like an angle grinder. An angular grinder requires a great speed to perform its job well and without safety precautions, that might be dangerous. Some people like to use angle grinders without the adjustable guard, thinking this will help to work freely. Honestly, I prefer otherwise. The guard is there for a reason and that is to protect you from speedy byproducts. Also, the guard is called adjustable because it can be adjusted to facilitate you to work at different angles. Make sure your grinder has a “dead man switch’, which prevents the grinder from starting by accidentally pressing the start switch. It will be needed to turn the dead man switch off before working again after an interval, which is a nice mechanism to ensure your safety. Also, your grinder should contain an electric brake system. The mechanism will shut off the grinder automatically in 2 seconds or less if the machine gets overheated. Dust ejection, paddle switches, spindle locks are some of the other features that not only keep you safe but also your machine by making it last longer and operate smoothly. Just like you wouldn’t need a sports car if you live in an area where traffic congestion are rampant, you do not need high power motor for every job. If you need an angular grinder for house use or light jobs, purchasing a grinder that has the highest power won’t make sense, because you’ll never use full power. If you are just looking for replacing your conventional sand paper to remove paint, go for a lower power grinder if you’re looking for some high-end grinding and cutting task, go for a higher motor. The price depends on many things. The more features the grinder comes with, the pricier it is. Also brand and warranty play a role. You need to pick the best angular grinder that comes within your budget and fulfill your requirements. Don’t get me wrong, I’m not against new brands coming in the market and providing quality products. The thing is, popular brands are popular for a reason. They are widely discussed and under a lot of scrutiny in forms of reviews, ratings, discussions. The risk of them being bad quality is very low. Yes, there might be a chance that you can get a faulty product accidentally or a product that didn’t work out well for you. In this case, you can use the warranty, replace and refund policy the trusted brands offer and take seriously. An angle grinder can excel or ruin your work. Angle grinders operate at a high speed, which means if your grinder doesn’t perform well, your work is most probably ruined too. A grinder needs to be powerful enough to support your type of work. It should have ample RPM for the job. The grinder should start slowly and should have security features like auto on/off in case of overheating. The handle should provide enough grip to hold with comfort. When you’re going to buy an angle grinder, look for those features. The good news is, the market is competitive and Companies are trying to come up with the best features for the cheapest price. The bad news is, the low-quality grinders are hard to identify from this crowd. We hope this guide helped you to find the best angle grinder. Let us know which one worked for you the best. Welcome to the best Angle Grinder Buying Guide. We review some of the top models from: Dewalt, Bosch, Metabo, Porter-Cable and more. Hey David, I was looking for information regarding this and finally got one. Thanks for sharing the information with us. The article was a great help to me.